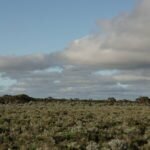 We tell the story of a different Nullarbor Plain. In truth, we are not yet within the Nullarbor Plain itself. 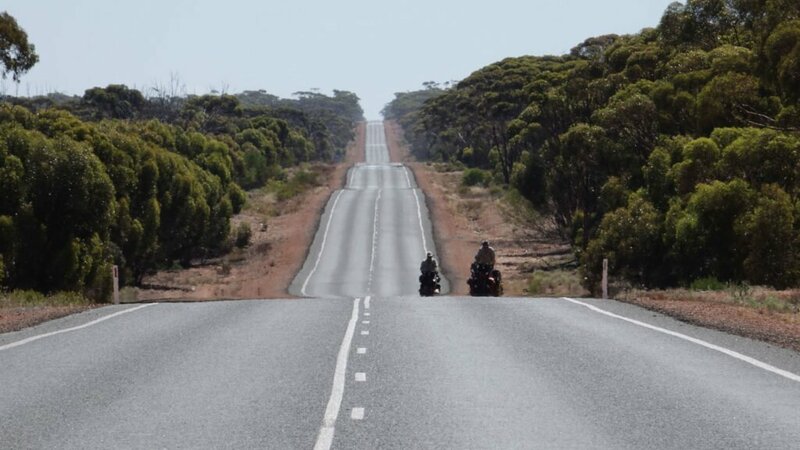 Many Australians call the stretch from Norseman’s exit to the arrival at Ceduna, but the reality is that the Nullarbor Plain National Park extends from Eucla to Yalata, 400 km. approximately. Why do I say it’s different? This section is one of the most desert places in all of Australia. Little rain and a lot of heat, especially at this time of year that it`s summertime. 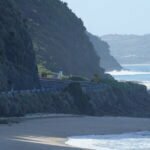 We are in February and we are pursuing an anticyclone with permanent rains that allow us to advance a few kilometers apart from a cold temperature that forces us to wear a jacket. We try not to pedal too much down the water because we can not afford to get sick, the trip continues and a fever could delay us too much. Anyway, that’s what I mean with a different Nullarbor Plain. I understand that these rains must be ideal for these dry soils where a bit of green is admiration for anyone, but it definitely has us a little tired. We had to wait for a whole day sitting inside a bathroom and today is another day where you just have to sit, wait, read, write or just contemplate. Depending on the perspective on how you look at it, this situation can be beautiful too. 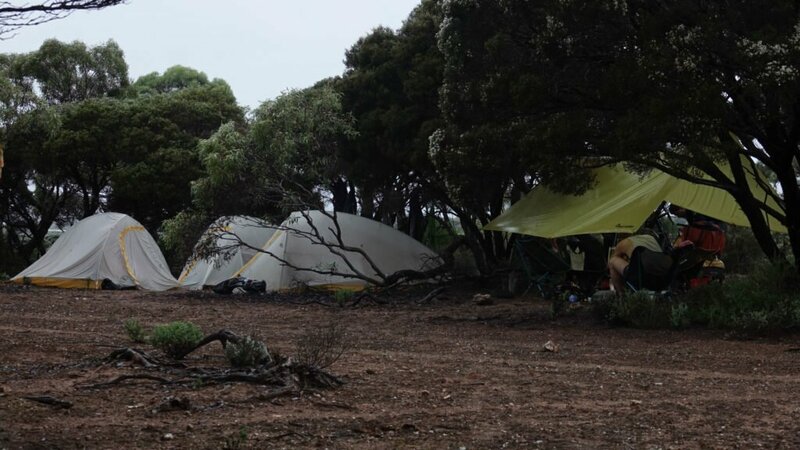 We rest, the trees cool and the moment of writing appears surrounded by nature and kangaroos. Nothing bad. We thought that this route covered 1200 km. without any trees, but the first days we were surprised to see some vast and beautiful trees. With an intense and clear green color in their glasses that bathed with the orange of the sun achieved a mixture that looked like a painting. Thus we managed to sit on the long bikes almost without feeling it. We were able to ride a lot and in a very enjoyable way. The places where you can find provisions or a telephone signal (or at least some people) are separated by 200 km. one of the other, but that did not matter. Pedaling became easy and our bicycles carried everything necessary to be independent of these places where, obviously, things are very expensive. We thought that walking this way was going to be very easy. We were even surprised to hear that many Australians highlight how lonely and hard this stretch was, too simple for us. Suddenly, nature took out these airs of greatness with which we had been carrying and showed us that not everything is as simple as it seems. 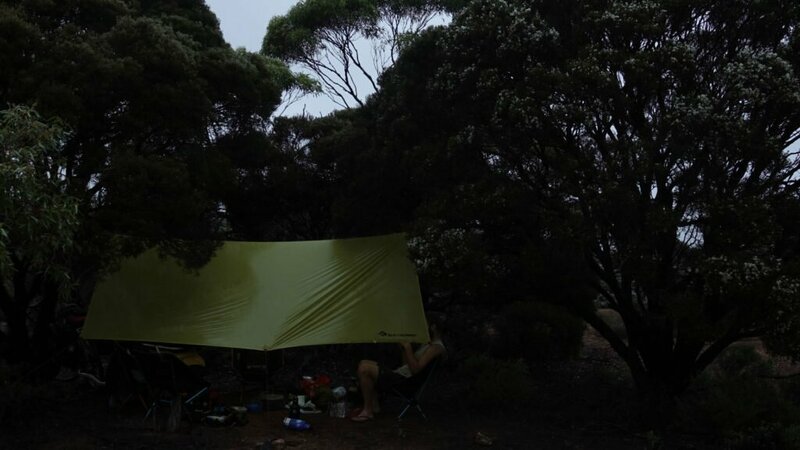 The rains started and all our clothes along with our sleeping tents got wet. The looks in the morning, in silence, showed that little by little things were getting difficult. The confinement in the bathroom bothered someone and the impotence of wanting to move forward and not being able to despair a little. Thus between talks, silences, readings, fugas appearances of people who came to talk, we spent the day and night came. As always happens to us, there is no harm that does not come good. An elderly couple living on the road 11 years ago came up and gave us the richest dinner of our lives. A hot stew to raise our spirits. The next morning of that day “lost” another pair of divers walked towards us and kindly gave us water (the most precious), fruit and sweet cakes that made us good to the soul. That way we started pedaling under the rain because waiting in the bathroom was not a valid option. It was 27 km. faster since our trip began. We made them very motivated with Aleix constantly shouting “Come on, come on, come on !!!”. It was a special day, where, for the first time, we went together and with the same rhythm during the whole day of pedaling, besides fighting against the rain and against our own limitations. We arrived at Caiguna, another of these stations that are in the middle of nowhere and where things go three or four times more expensive than in any commonplace. We were happy and motivated. It should be noted that this trip is subject to constant changes of mood. It is like a roller coaster where in the morning you can lift badly, without desire, dejected and at night you can be the happiest person in the world. In Caiguna everything was good humor. We had achieved our goal of the day and we thought we could rest, take a shower, engage in some conversations, make new friends. But sometimes people complicate things. The owners of the station were not at all kind and all they wanted from us was the wallet. If not, we bought. The surprising thing was that despite having bought a bread, two snacks, some cookies and having paid for two showers they wanted to take us out. We left thinking that they were two bitter of life, but in reality, everyone does what they can and probably in other circumstances we could have had a good conversation. Who knows. Because I believe that good and bad situations have the same essence. They put us to the test and let us see that the perspective with which one looks at these encounters will determine our mood and our character. If one does not get angry and try to be empathetic, there was never a conflict because one of the two parties did not get into the problem. I have been told many times when in a fight one of the two does not want to fight there is no such fight. We try, or that we seek, that these situations serve us to learn because we know that all the people we come across want the best for our trip and we hope that all our expectations are met. We are still on this route that is not as easy as we thought. We are below a canvas that covers us kindly from the rain and gives us a space to think and reflect. On our side, we have trees, ants, kangaroos, spiders, flies, which are sure to be grateful for this water falling from the sky that provides life and growth. We thank the reader, the one who is interested and the one who looks for new ways of seeing good and bad things from another perspective.